SL Mascot: Water Water Everywhere! I've come to the conclusion that a lot of the most interesting work (to date) in SL has come from the "not for profit" sector - libraries, educational establishments and charities. With this in mind, I was trawling through a series of podcasts by Wayne MacPhail on his rabble page Who's On Second - "A podcast about nonprofits and educators jacked into Second Life"
Wayne is currently (5th March 2007) up to podcast episode 15. 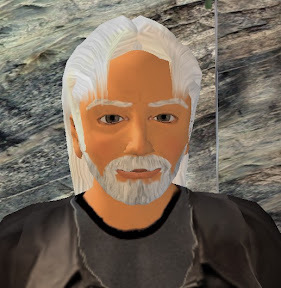 Each one is generally an interview with someone from the educator or nonprofit sector who has been making good use of Second Life. Having listened to a number of Wayne's podcasts, I was inspired to take a look at Better World (Better World 24, 51, 22) - an island full of exhibits to bring attention to world issues. Some of these were quite moving, and I really ought to write a blog entry about them. However, whilst on my travels, I bumped into Delia Lake (a.k.a. Linda Kelly in RL) who has created the Centre for Water Studies. Delia has recreated a number of different water habitats, showing how important water is to our environment. She takes care to change the habitats with the seasons, and so the centre will always have something new to discover. It's actually a very relaxing place to visit, with the sound of breaking waves on the beach. Here's a photograph of Delia by the pond. If you are particularly adventurous, you can take a ride on the back of an Orca (Killer Whale) whilst exploring the fish in a virtual reef. If you look carefully, you can see Team sitting sidesaddle on the Orca's back! 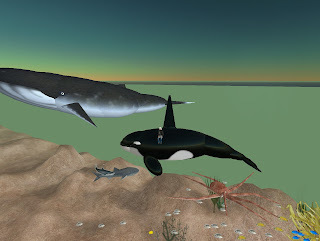 One of the great benefits of SL as an educational tool, is that you can get a feel for the size of something like a killer whale - by riding on its back, or swimming around it with your avatar. Delia was inspired to create the Centre for Water Studies by memories of her grandmother taking her to see ponds and lakes when she was a child..... and now she is doing the same with her grandchildren... but this time in the virtual world of Second Life!